THANK YOU MATTHEW HOLSEN AND KELOLAND TV for an informative video! Check it out! Panel of speakers at the Tribute To The Troops event on November 12, 2016. FIRST FAMILY FROM SOUTH DAKOTA! After hosting 42 families from 21 different states, we finally hosted our first family from SOUTH DAKOTA! Watch this VIDEO for highlights of their stay. SOUTH DAKOTA COMMUNITY FOUNDATION released a newly produced video telling THE STORY about OPERATION BLACK HILLS CABIN. Watch this video link from our ABOUT US/VIDEOS tab. OBHC'S video was the first of fifteen videos to be released throughout the year. Read the following Press Release for more information. (PIERRE, S.D.) – The South Dakota Community Foundation (SDCF) is proud to announce a new video series promoting philanthropists and philanthropic initiatives in South Dakota. The videos are the result of a partnership between the SDCF, OTA and Passenger Productions. A total of 15 videos have been created to inspire, motivate and educate the public about philanthropy in our state. The first two videos to be released will feature Operation Black Hills Cabin and the Ty Eschenbaum Foundation. Operation Black Hills Cabin was established in 2011 as a way to thank qualified combat-disabled veterans from Iraq and Afghanistan conflicts. They are granted a one week respite for their immediate family in a three bedroom, two bath cabin in Custer, S.D. Ty Eschenbaum started his foundation in 2011 to provide financial support to youth cancer survivors and their families. Additional videos will be released each month and may be found at sdcommunityfoundation.org or weareota.com. Since 2009, OTA has served as a collaborative network for the region’s creative class, offering extraordinary experiences and engagements that educate, empower, and serve as a catalyst for community-builders and change agents to improve the lives of all people living in MinnesOTA, North DakOTA, and South DakOTA. The South Dakota Community Foundation is a public non-profit organization established in 1987. The Foundation commingles money from 700 funds for investment and administration purposes. Earnings from $230 million are available for distribution for non-profit, charitable and scholarship purposes. SAVING FAMILIES AND RELATIONSHIPS --- check out Custer, South Dakota's "Way To Say Thank You" from South Dakota Public Broadcasting Reporter, Cara Hetland. LISTEN to South Dakota Secretary of Military and Veterans Affairs, Larry Zimmerman as well as Co-Founder, Pat Baird, as they give details regarding OPERATION BLACK HILLS CABIN to South Dakota Public Broadcasting. Click HERE to listen to details of how we got started, why we got started, and the impact we are making. DOWN COUNTRY ROADS: We were featured in the 2014 January - February issue of Down Country Roads Magazine published by Southern Hills Publishing, Inc., story entitled "Providing Respite for Wounded Warriors" by Norma Najacht. This was a very touching story and well worth your time and effort to locate a copy to read. Back copies of Down Country Roads can be obtained at the Custer County Chronicle in Custer. 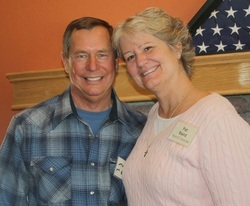 CITIZENS OF THE YEAR: In January of 2014, Pat and Jeff Baird were selected as Custer's Citizens of the Year due to their tireless efforts involving Operation Black Hills Cabin. This was a well-deserved honor bestowed on our Co-founders! OBHC has in so many ways brought the residents and businesses in Custer and the surrounding area together to say THANK YOU and show our gratitude to those who have given so much. 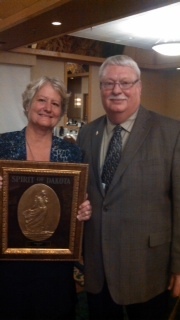 SPIRIT OF DAKOTA AWARD: In October of 2013, our Co-founder and President of the Board, Patricia K. Baird, was presented the Spirit of Dakota Award by the spirit of Dakota Award Society. They annually honor one woman, whose leadership qualities, courage, strength of character and community commitment illustrate the best of South Dakota womanhood. The women nominated for this award are role models who promote the social, civic, cultural and/or educational advancement of others. As recipient of this award, Patricia K.Baird has made a very large difference in so many people's lives especially the families hosted by Operation Black Hills Cabin. BLACK HILLS PIONEER: Operation Black Hills Cabin was featured in the November 4th issue of the Black Hills Pioneer newspaper. Click HERE to view the complete article. SIOUX FALLS ARGUS LEADER has reported on the Frontier Fund set up for the State of South Dakota's 125th anniversary. OBHC was very fortunate to be selected to receive one of seventeen grants given to nonprofits. Check out this story on argusleader.com: http://argusne.ws/1ADPxJh. Our hosted families in 2015 will benefit from this award by receiving partial payment for their transportation costs.